Andrew Taylor Still was first on the scene following his remarkable discovery that the informed touch of the hand on the patient was of greater benefit than the use of drugs and some surgery, but it was John Martin Littlejohn who laid down the Principles and devised the Techniques that have survived every kind of test and have remained with us up to the present time. 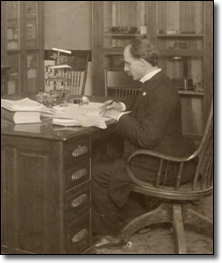 It was Littlejohn who observed the physiological dominance in the function/structure equation and the importance of inhibition and stimulation in the nervous interplay, sympathetic and central. He also emphasised the role played by vasomotion in the control of the blood circulation. 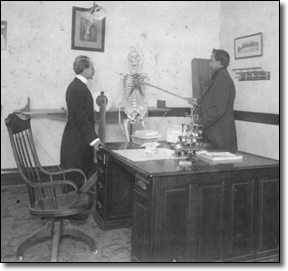 But, perhaps his most important contribution to our principles is the statement that ‘you cannot adjust the abnormal to the normal.’ This was followed by an injunction to integrate the body for which purpose the Body Adjustment became a clinical necessity. Littlejohn has reminded us that Order is the law of life and that Harmony is the principle of the body architecture and the body activities. Anything that throws this order and harmony into a condition of disorder is a productive cause of disease. Here we use the word ‘lesion’ to indicate any deviation in any tissue or organ of the body away from the normal. A misplaced bone, a contracted, contractured or tetanized muscle or displaced organ may form the basis of such a lesion and leading to all kinds of complications that may arise, involving especially the fluids of the body, the blood and lymph and the nerve force that represents the energy of the master and controlling the tissue of the body. In the normal body, the blood is formed within itself for its own use and all other blood is foreign. If the blood does not follow its normal course anywhere along the circulation path, there is derangement. The nerve force represents vitality. With its centre in the brain, the nerves are distributed over the body, with subsidiary centres, having a distinct path and supplying a particular part or function in the body. Applied Anatomy Head’s and Hilton’s Laws. The skeletal system. The cranial, spinal and sympathetic nerves. The plexi. The Spinal Centres. The 10th Cranial Nerve. The great Sciatic Nerve. Posture. Applied Physiology The nature of the Osteopathic Lesion. 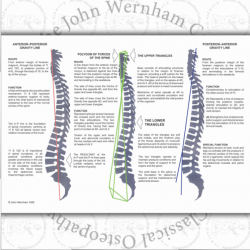 The biological life of the spine. Changes associated with lesion conditions. Mobility and Immobility. The Cerebro Spinal Fluid. Arrhythmia. Pathology Obstruction or irritation leading to mal-nutrition and neurosis, the latter underlying every form of disease. Commonly called pathology but is really modified physiology. Before morbid change there must be functional perversion. All diseased conditions start in exaggeration or diminution of normal physiological activity. The human body is not a machine but it is subject to mechanical law. That is to say it is weight-bearing and the lines of stress are present in the living organism as they are present in every object on this earth-plane. Parallel, non-parallel and curved, the lines are arbitrary in operation, having a direction and magnitude that will only by denied at the expense of the body and no amount of corrective treatment will suffice in many cases if the stress remains. The base-line, the axis of symmetry, the centre of gravity, the polygon of forces, the upper and lower triangles have been fully established and the accuracy of this scientific data is beyond question. 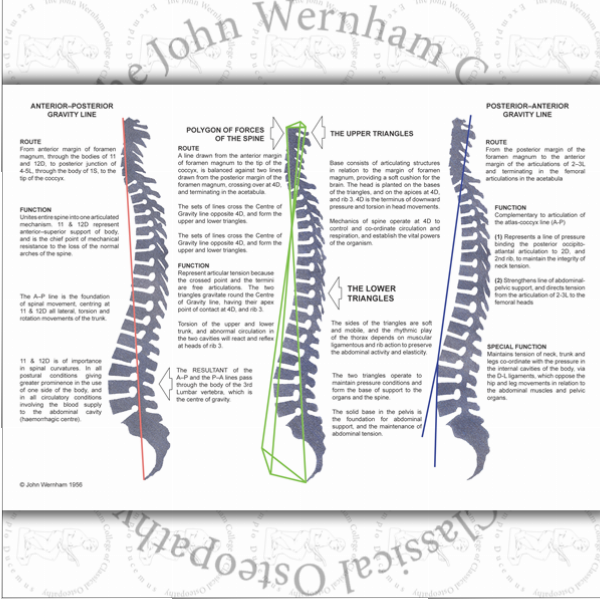 The curved lines bring a new set of problems, representing the dynamics of the moving body of which the central ‘double arch’ or ‘power house’ of the spinal column, is the most important factor. Certain vertebrae act as pivots and others as keystones and the balance of the arches is of special significance in the maintenance of recovery power from the effects of stress. Diagnosis begins with observation in the erect position. We note body movement or its lack with particular reference to the spine and pelvis, in slow flexion as each vertebra comes into play singly or in groups. Palpation is then introduced, the fingers becoming antennae to pick up impressions of tissue change, tension, altered temperature and pain. This is followed by tests in all the cardinal movements of flexion, extension, rotation and sidebending. The adjustive leverage employs the extremities with effect on the trunk of the body, the free hand supplying the fulcrum. Both must be coordinated and may be addressed to all structures. The articulation thus induced is mild and controlled, according to the condition and need of the area undergoing the process of adjustment. The leverage is continuous but the timing is critical. It must be emphasised that in the disordered body, no structure or function can evade involvement. This means that the body is a unit and must be treated as such. The body is a living organism or an invisible energy that demands our attention through the visible structures and is not to be ignored. Aims & objectives: the development of the knowledge & transferable skills required to begin applying the philosophy, principles & concepts of Body Adjustment in practice; to stimulate an academic & practical interest in further studies relating to alternative approaches to medicine; to provide a route to Advanced Seminars. Total hours: approximately 100 taught hours plus directed & guided home-study. Teaching schedule: 20 days over a period of 6-9 months typically done in five 4–day seminars. This enables students to assimilate and practise what they have learnt during the seminars.